The sclera is the white, leathery outer “shell” of the eyeball. Most scleritis is visible and obvious, because the eye is red, often with a slightly magenta hue. Scleritis is painful and the eye is often quite tender. Scleritisis when any part of the sclera is inflamed. 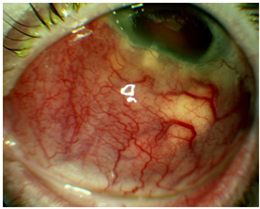 Scleritis can cause visual loss by damaging the structures on the inside of the eye, and because it weakens the sclera, changing the shape of the eyeball. How do we treat scleritis?